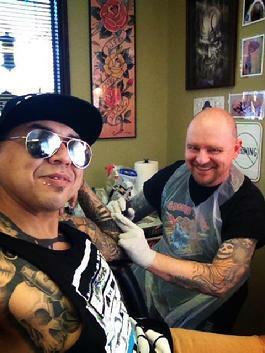 PermaGrafix Tattoo is owned and operated by award winning tattoo artist, "K.C." Chris Whittaker. He has 20 years experience, and has done work for NFL players, OSU athletes, KU athletes, and John Moyer the bass player for Disturbed. His work includes sleeves for Rich Seigler of the Pittsburgh Steelers, several tattoos on St. Louis Rams' running back, Steven Jackson, Brandon Browner of the Denver Broncos, and former OSU quarterback, Derrick Anderson. Worldwide published work by Chris Whittaker have been printed in Tattoo magazine, Tattoo Revue, Tattoos for Men, Tattoos for Women, The Best of Tattoos for Women, The Best of Tattoos for Men, Skin Art, Dark Skin Art, and more. His Instagram has his newest work , follow @permagrafix on Instagram! His Facebook Fan Page has TONS of his NEWER tattoo work, go there and click photos them albums to see albums of different styles of work he has done, his facebook profile is http://www.facebook.com/permagrafix and our Facebook Fan Page http://www.facebook.com/pages/PermaGrafix-Tattoos-Body-Piercing/193764071621 check it out & add yourself to his friends & PermaGrafix fans list!